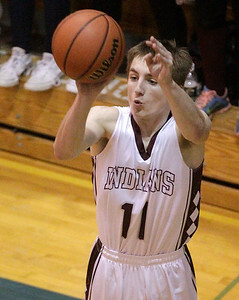 Matthew Apgar - mapgar@shawmedia.com Michael Volkening of Marengo takes a shot against Belvidere during their IHSA Class 3A regional boys basketball semifinal game on Tuesday, March 01, 2016 at Woodstock High School in Woodstock. 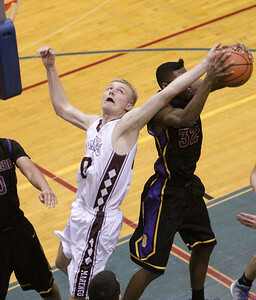 Marengo lost 69-59. 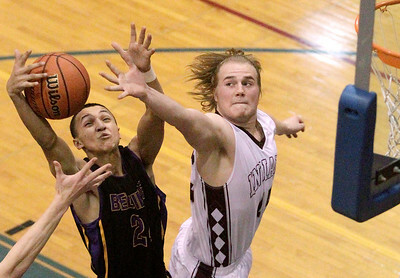 Matthew Apgar - mapgar@shawmedia.com Benjamin Volkening of Marengo, center, takes a shot on Belvidere's Deante Barnes, left, and Will Morris during their IHSA Class 3A regional boys basketball semifinal game on Tuesday, March 01, 2016 at Woodstock High School in Woodstock. Marengo lost 69-59. 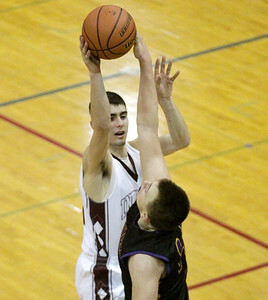 Matthew Apgar - mapgar@shawmedia.com Colton Wightman of Marengo, right, reaches out for the rebound with Nathan Horton of Belvidere, left, during their IHSA Class 3A regional boys basketball semifinal game on Tuesday, March 01, 2016 at Woodstock High School in Woodstock. Marengo lost 69-59. 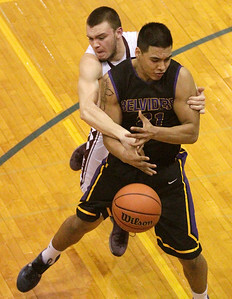 Matthew Apgar - mapgar@shawmedia.com Michael Volkening of Marengo, center, tries to gain control of the ball from Xavier Dent, left, and Deante Barnes, right, both of Belvidere, during their IHSA Class 3A regional boys basketball semifinal game on Tuesday, March 01, 2016 at Woodstock High School in Woodstock. 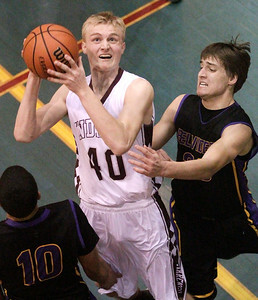 Marengo lost 69-59. Matthew Apgar - mapgar@shawmedia.com Marengo takes on Belvidere during their IHSA Class 3A regional boys basketball semifinal game on Tuesday, March 01, 2016 at Woodstock High School in Woodstock. Marengo lost 69-59. 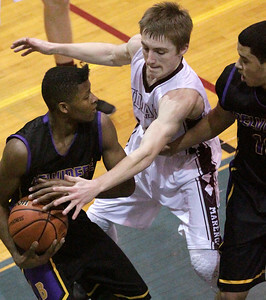 Matthew Apgar - mapgar@shawmedia.com Benjamin Volkening of Marengo, center, gets caught between Deante Barnes, left, and Zavier Dent of Belvidere as they vie for the rebound during their IHSA Class 3A regional boys basketball semifinal game on Tuesday, March 01, 2016 at Woodstock High School in Woodstock. Marengo lost 69-59. 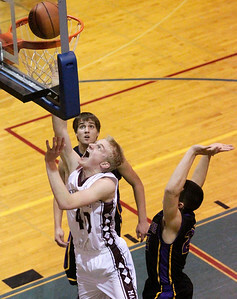 Matthew Apgar - mapgar@shawmedia.com Benjamin Volkening of Marengo shoots a layup against Belvidere during their IHSA Class 3A regional boys basketball semifinal game on Tuesday, March 01, 2016 at Woodstock High School in Woodstock. Marengo lost 69-59. 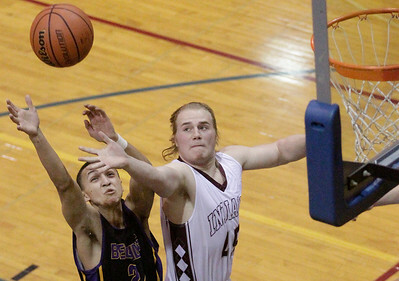 Matthew Apgar - mapgar@shawmedia.com Benjamin Volkening of Marengo, left, takes a shot, blocked by Deante Barnes of Belvidere, during their IHSA Class 3A regional boys basketball semifinal game on Tuesday, March 01, 2016 at Woodstock High School in Woodstock. Marengo lost 69-59. 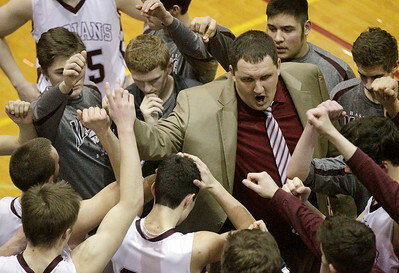 Matthew Apgar - mapgar@shawmedia.com Marengo coach Nate Wright tries to rally the Indians against Belvidere during their IHSA Class 3A regional boys basketball semifinal game on Tuesday, March 01, 2016 at Woodstock High School in Woodstock. Marengo lost 69-59. 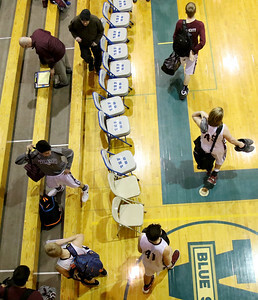 Matthew Apgar - mapgar@shawmedia.com Marengo players leave the gym after losing to Belvidere during their IHSA Class 3A regional boys basketball semifinal game on Tuesday, March 01, 2016 at Woodstock High School in Woodstock. Marengo lost 69-59. 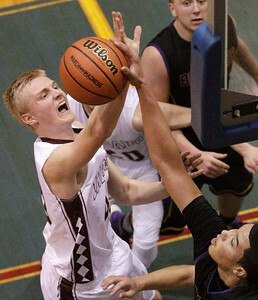 Marengo takes on Belvidere during their IHSA Class 3A regional boys basketball semifinal game on Tuesday, March 01, 2016 at Woodstock High School in Woodstock. Marengo lost 69-59.